Southland (Māori: Murihiku) is New Zealand's southernmost region. It consists mainly of the southwestern portion of the South Island and Stewart Island / Rakiura. It includes Southland District, Gore District and the city of Invercargill. The region covers over 3.1 million hectares and spans over 3,400 km of coast. Southland was a scene of early extended contact between Europeans and Maori, in this case sealers, whalers and missionaries such as Wohlers at Ruapuke. In 1852, James Menzies, leader of the Southland separatist movement, became the first Superintendent of the tiny Southland electorate which was still part of the large Otago region. Under the influence of Menzies, Southland Province (a small part of the present Region, centred on Invercargill) seceded from Otago in 1861 following the escalation of political tensions. However, rising debt forced Southland to rejoin Otago in 1870, and the province was abolished entirely when the Abolition of the Provinces Act came into force on 1 November 1876. In the 1880s, the development of an export industry based on butter and cheese encouraged the growth of dairy farming in Southland. Consequently, the colony's first dairy factory was established at Edendale in 1882. Much of this export went to the United Kingdom. Now, Edendale is the site of the world's largest raw milk-processing plant, and Southland's economy is based on agriculture, tourism, fishing, forestry, coal, and hydropower. A map showing population density in the Southland Region at the 2006 census. Southland's two principal urban settlements are the city of Invercargill and the town of Gore. Southland covers an area of 28,681 square kilometres. As of June 2018 it had a population of 99,100, making it one of New Zealand's most sparsely populated areas. The sizable western part Fiordland is almost empty of permanent human inhabitation. Southland is divided into two parliamentary electorates. The large rural electorate of Clutha-Southland, held by Hamish Walker, also includes some of the neighbouring Otago Region. The seat of Invercargill is held by Sarah Dowie. Both are members of the opposition National Party. Under the Maori seats system, Southland is part of the large Te Tai Tonga electorate which covers the entire South Island and the surrounding islands, and is currently held by the Labour Party MP Rino Tirikatene. Regional responsibilities are handled by the Southland Regional Council (Environment Southland). Three Territorial Authorities fall entirely within Southland. The Invercargill City Council governs Invercargill itself, together with some adjoining rural areas. Much of the remaining area of Southland, including all of Stewart Island/Rakiura, falls within the Southland District, which is administered by its own Council, also based in Invercargill. The Gore District Council administers the town of the same name and its rural hinterland. In 2001, three authorities (Invercargill City, Southland District and Gore District Councils) created the joint initiative agency Venture Southland which is the agency responsible for the region’s economic and community development initiatives and tourism promotion. The region is home to two national parks: Fiordland National Park and Rakiura National Park. The former which covers 7,860 square kilometres; making it New Zealand's largest national park. Southland also includes Stewart Island, 85% of which is covered by Rakiura National Park. Both parks are administrated by the Department of Conservation. Politically, Southland proper extends from Fiordland in the west past the Mataura River to the Catlins the east. To the north, Southland is framed by the Darran and Eyre Mountains. Farther south lies Stewart Island which is separated from the mainland by the Foveaux Strait. Southland contains New Zealand's highest waterfall—the Browne Falls. Lake Hauroko is the deepest lake in the country. The highest peak in Southland is Mount Tutoko, which is part of the Darran mountains. The largest lake in Southland is Lake Te Anau followed by Lake Manapouri which both lie within the boundaries of Fiordland National Park. Established on 20 February 1905, it is the largest national park in New Zealand—covering much of Fiordland which is devoid of human settlement. Fiordland's terrain is dominated by mountains, fjords and glacial lakes carved up by glaciations during the last ice age, between 75,000 to 15,000 years ago. The region's coast is dotted by several fjords and other sea inlets which stretch from Milford Sound in the north to Preservation Inlet to the south. Farther north and east of Fiordland lie the Darran and Eyre Mountains which are part of the block of schist that extends into neighboring Central Otago. 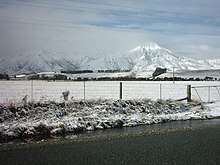 Farther east of the Waiau River, the Southland Plains predominate which include some of New Zealand's most fertile farmlands. The region's two principal settlements Invercargill and Gore are located on the plains. The Plains extend from the Waiau River in the west to the Mataura River to the east. It can be divided into three broad areas: the Southland plain proper, the Waimea Plains and the lower Waiau plain to the west near the Waiau river. The southern part of these plains (including the Awarua Plains along the coast east of Bluff) contains much wetland and swamp. In the far southeast of Southland rises the rough hill country of The Catlins. This area is divided between Southland and the neighbouring Otago Region, with the largest settlement, Owaka, being within Otago. The hills of The Catlins form part of a major geological fold system, the Southland Syncline, which extends from the coast northwestward, and include the Hokonui Hills above Gore. Off the coast of Southland lies the Great South Basin which stretches over 500,000 km2 (covering an area 1.5 times New Zealand’s land mass). It is one of the country's largest undeveloped offshore petroleum basins with prospects for both oil and gas. Weather conditions in Southland are cooler and wetter than the other regions of New Zealand due to its distance from the Equator. However, they can be broken down into three types: the temperate oceanic climate of the coastal regions, the continental climate of the interior and the wetter mountain climate of Fiordland to the west. Due to its closer proximity to the South Pole, the Aurora Australis or "Southern Lights" are more commonly seen than in other regions. Winters are colder and more severe than other regions. The mean maximum temperature in July is 9.5 °C and Southland’s lowest recorded temperature was −18 °C in July 1946. Snow and frost also frequently occur in inland areas but are less common and extreme in coastal areas where the oceans act as a moderating factor. The long-lasting cool and wet conditions are influenced by the presence of a stationary low-pressure zone to the southeast of the country. Fiordland has a wet mountain climate though conditions vary due to altitude and exposure. Rainfall is the highest in the country and varies between 6,500 to 7,500 mm annually. The farthest coastal reaches of Fiordland are characterized by a limited temperature range with increasing rainfall at higher altitudes. The moist wet climate is influenced by approaching low-pressure systems which sweep across the country entering Fiordland. Satellite image of most of New Zealand's Southland Region, including Stewart Island and southern Fiordland. Southland is one of New Zealand’s most sparsely populated regions with a population of 99,100 (June 2018). Due to a “drift north” between 1996 and 2001, Southland’s population declined by 6.3% though that trend abated subsequently. With a population of 52,000 Invercargill, the region’s main centre and seat of local government, makes up half of Southland’s total. Six other centers have populations over 1,000: Gore, Mataura, Winton, Riverton, Bluff and Te Anau. Most of Southland’s population is concentrated on the eastern Southland Plains. Fiordland, the western part of the region, is almost totally devoid of permanent human settlement. Approximately 90% of the population is of European descent. A relatively high proportion of nineteenth century migrants came from Scotland and Ireland. Māori comprise about 13% of the population. Māori are largely concentrated around the port of Bluff. During the 1940s, the development of the freezing works boosted a short-term immigration to the region by North Island Māori. In the last decade the Asian-origin population of Southland increased owing to the recruitment of dairy workers, many of them from the Philippines. In 2013 the population of Asian origin accounted for 3.2% of the Southland total. This is a significant increase (albeit from a low base) when compared with 2001. Around 51.6 percent of Southland's population affiliated with Christianity at the 2013 Census, making it one of two regions in New Zealand (the other being Hawke's Bay) with a majority Christian population. The needs of the new Filipino population has seen Catholic churches offering services in Tagalog, a principal language of the Philippines. The West Coast aside, Southland has New Zealand's strongest regional identity. It is the only part of New Zealand which has a distinct regional accent (shared with neighboring parts of Otago), characterized in particular by a rolling 'r'. Food-wise, cheese rolls are a Southland specialty  and swedes are a popular vegetable, prepared and eaten as are pumpkin and kumara (sweet potato) elsewhere in New Zealand. For many years a television channel, known as Southland TV from 2003-07, later Cue TV, transmitted Southland content. The strength of Southland identity may owe something to the relatively high proportion of New Zealand-born in the region - 85% compared with 70% for New Zealand as a whole at the 2013 census. The region’s economy is based on agriculture, tourism, fishing, forestry and energy resources like coal and hydropower. The agriculture industry includes both sheep and dairy farming which both account for a significant proportion of the region’s revenue and export receipts. Much of this farming is on the Southland Plains, with expansion into the more remote western regions since the 1950s and 1960s. Southland also has the world’s largest raw milk-processing plant at the town of Edendale which was established by Fonterra. Other sizeable industries in Southland include coal and hydroelectric power. Eastern Southland has significant deposits of lignite which are considered to be New Zealand's biggest fossil fuel energy resource. Solid Energy operated open cast lignite mines at Newvale and Ohai until its 2015 bankruptcy. Southland hosts the nation’s largest hydroelectric power station at Manapouri which is owned by Meridian Energy and powers the Tiwai Point Aluminium Smelter. The Manapouri project generated much controversy from environmental groups which initiated the Save Manapouri Campaign in opposition to rising water levels in nearby lakes. The sub-national GDP of the Southland region was estimated at US$3.023 billion in 2003, 2% of New Zealand's national GDP. ^ a b Cite error: The named reference NZ_population_data was invoked but never defined (see the help page). ^ a b Hotton, Mike (26 September 2009). "New milk dryer makes Edendale processor 'world's biggest'". The Southland Times. Retrieved 4 October 2009. ^ a b c Grant, David (2 March 2009). "Southland region: Overview". Te Ara: The Encyclopedia of New Zealand. Retrieved 18 February 2010. ^ a b "Subnational Population Estimates: At 30 June 2018 (final)". Statistics New Zealand. 15 November 2018. Retrieved 21 November 2018. ^ "About Venture Southland". Venture Southland. Retrieved 14 March 2013. ^ a b Grant, David (24 November 2009). "Southland region: Geology and landforms". Te Ara: The Encyclopedia of New Zealand. Retrieved 18 January 2010. ^ Guyton, Saelyn (8 January 2010). "Fire Service stretched as hail, rain pummel Invercargill". Otago Daily Times. Retrieved 8 January 2010. ^ "A Bit of a Breather!" – 26 November 2008 -weatherwatch.co.nz. – Retrieved 13 December 2010. ^ "New Zealand Climate Summary: Summer 2017-18" (PDF). NIWA. Retrieved 20 August 2018. ^ Grant, David (2 March 2009). "Southland region – Climate". Te Ara – the Encyclopedia of New Zealand. Retrieved 8 January 2010. ^ a b Grant, David (2 March 2009). "Southland region: Southland people". Te Ara: The Encyclopedia of New Zealand. Retrieved 18 February 2010. ^ a b c "2013 Census QuickStats about a place". ^ "Invercargill and Southland - ANZF Reporting". www.asianz.org.nz. ^ "2013 Census QuickStats about culture and identity – tables". Statistics New Zealand. 15 April 2014. Retrieved 5 February 2016. ^ "Catholic churches in Southland conduct masses in Filipino to support growing community". Stuff. ^ "Southland Cheese Rolls". 10 August 2014. ^ Grant, David (2 March 2009). "Southland region: Farming: 1950s to present day". Te Ara: The Encyclopedia of New Zealand. Retrieved 18 February 2010. ^ Alan Sherwood and Jock Phillips (2 March 2009). "Coal and coal mining – Coal resources". Te Ara: The Encyclopedia of New Zealand. Ministry for Culture and Heritage / Te Manatu Taonga. Retrieved 13 December 2010. ^ "Southland Energy Consortium". Energy.southlandnz.com. Retrieved 2 August 2010. Wikimedia Commons has media related to Southland Region. Wikivoyage has a travel guide for Southland. This page was last edited on 11 April 2019, at 21:03 (UTC).